Take the opportunity to do the Hill Inlet lookout and Betty's Beach walk. 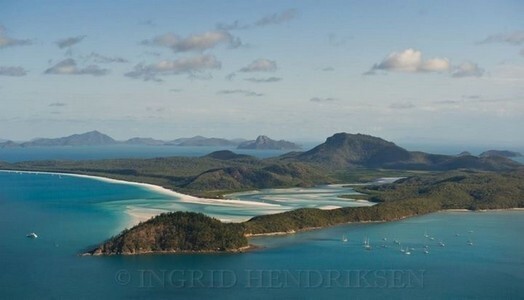 Hill Inlet is the top 3 photographed place in Australia, Don’t forget your camera!! Make sure you take a towel so you can have a swim at the beach too. Pull up anchor and head north to Hook Passage map C17 and head along the passage passing historic Hook Island Observatory (now closed). Drop anchor at Cid Harbour map C19, a very safe anchorage that was used during Second World War by the American and Australian Navies. This is a great night’s anchorage to take in the sunsets, do a spot of fishing and possibly see turtles and dugong who feed on the sea grass. 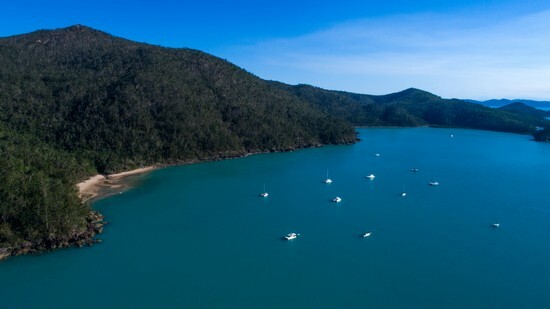 Cid Harbour, while a good sheltered anchorage, is not a known or popular swimming/snorkelling destination in the Whitsundays and well away from the popular destinations in the Whitsundays for which it is famous for. We don't recommend participating in any in water activities. Sharks are possible attracted to the Cid Harbour area by the large number of vessels which anchor overnight and the behaviour of disposing of food or fishing scraps overboard. This is a practice both CCY and the Department of Environment and Science discourages. Cid Harbour is not only considered safe anchorage for bareboat charters but the Australian and American Navy sort refuge there in May 1942 from the battle of the Coral Sea. The four day skirmish marks histories first air-sea battle. Australian oiler vessel the "Kurumba" stationed in Cid Harbour was a welcome sight for Admiral John Crace and his fleet,who needed refueling. You can be for forgiven for expecting a bustling harbour town reception here, there is no physical harbour in the sense of the word. It's simply a stunning all weather anchorage. Walk to Hill Inlet look out at low tide as the sand swirls will be even more amazing at low tide.. Tracks are well marked and easy to walk, but take some shoes to access the coral beach.